The product will be handy for voiceover actors, podcasters and broadcasters, but also for touring musicians, who need to record overdubs in studio quality, on-the-spot. The built-in high-quality mic preamp, featuring a Neutrik Combo jack and true 48V phantom power, lets users choose their favorite microphones. Its Hi-Z feature allows directly plugging in electric guitars and basses, making MicPort Pro 2 an ideal practice tool, idea pad, or streaming interface for the phone. 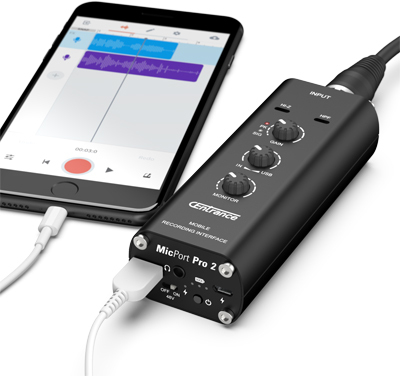 MicPort Pro 2 turns a smartphone into a portable DAW, ideal for capturing interviews, musical ideas, instrument overdubs, or live events at a remote location. Invaluable for podcasting, video blogging, newsgathering, live streaming, songwriting, and other mobile recording uses, the hand-held recording interface makes it easy to record professional-quality audio anywhere. An internal, long-lasting rechargeable battery sets the CEntrance product apart from other portable audio interfaces and makes it the ideal companion for the road. The tripod-mountable device will be also appealing to video bloggers. Paired with a smartphone or a video camera, the product improves audio quality over typical on-camera audio, dramatically raising production values of semi-professional video shoots. “I’ve had a vision of ‘personal audio’ and the tiny MicPort Pro 2 fits right in. It puts real professional recording in your pocket, right next to your phone-and there is still room for your keys,” added Goodman. The new MicPort Pro 2 has an MSRP of $249.99 USD, ship date TBA. CEntrance is currently shipping two models of MixerFace: “R4” and “R4R” (with the onboard SD-Card recorder) with MSRP of $349.99 and $449.99 USD respectively. CEntrance is a leading manufacturer of professional-grade recording devices and award-winning personal audio solutions. MicPort Pro 2 builds on the legacy of the original USB-powered MicPort Pro, and with the added built-in battery technology it takes the Company’s recording product line to a new level of portability and power. MicPort Pro 2 is compatible with most smartphones, tablets and laptops/desktops, including Android and Apple iOS, and macOS and Windows-based computers using a native driver. Smaller than a microphone, the mobile recording interface is designed to simplify making high-quality audio recordings on the go and share digital projects online, all while delivering professional results. MicPort Pro(tm), MixerFace(tm), Mobile Recording Interface(tm), Jasmine Mic Pre(tm), BlueDAC(tm) are trademarks of CEntrance. All Trademarks are the property of their respective holders. All Rights Reserved.